What a way to brighten up a bathroom. The Rainbow shower curtain has a snow white background with 1/4 inch stripes. The stripe colors are ruby red, dark pink, light pink, aqua blue,bright yellow, bright orange and bright yellow green. Do not miss the matching rug which is also called Rainbow. 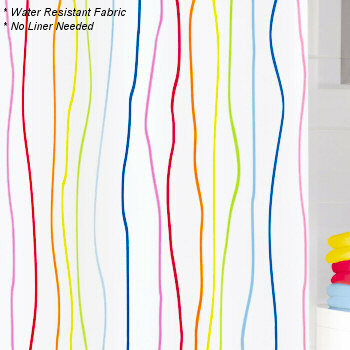 The Rainbow non toxic fabric shower curtain is available in standard tub width - 12 eyelets.